I've been using Evernote for close to 3 years now. It's one of the few programs I always have open on my computer. It's also the app I use most on my phone. I used to be a huge fan of notebooks (I still am), Evernote just lets me save those notes, search them and tag them. If you're a student, business owner, blogger, mom or planning any kind of event, Evernote will be useful to you. If you've tried Evernote before, and ditched it. Give this guide a chance, it's changed a lot of reader's minds so far. Up front, Evernote looks like a fancy online notebook - and it is, sort of. Imagine having a notebook that can hold a million other notebooks, with a million notes, and it can store files, photos and documents. This magical notebook is also searchable, editable, shareable and can be accessed from anywhere, online and offline. THAT is Evernote. These are where you write. You can have as many of these guys as you need. Think of notes as a page in a notebook (a page that can be as long as you need it to be). Notes can hold documents, files, text and images. Whatever you need to access or store goes into a note. This is a collection of notes. Simple enough. You can add as many notes as you need into one notebook. Things that fall into the same topics or categories usually make good notebooks. For example I have notebooks for school classes, my blog posts, my clients and bills. Stacks is an easy way to organize notebooks, like storing your notebooks on a shelf. Stacks can be made by dragging one notebook on top of another and adding additional notebooks as needed. I have stacks for personal files, my business and school. As mentioned in the video, the Evernote Beginner's Guide can be found HERE. Evernote really is very simple. There's a lot of different ways to use it though, which is why it is such a unique program. Whether or not you love Evernote will complete depends on how well your system is set up. Everyone has a different way of organizing their thoughts and organizing their ideas. I wanted to share my set-up to give you an idea of one option. I got a lot of these fantastic ideas from the YouTube user Evernote Scott. He has a TON of videos about Evernote and some great ideas, so if you want to know more, definitely take some time to check him out! Keep in mind that this is one of MANY ways to set up your Evernote account. You don't have to be this in-depth. You could make a notebook called work, school and personal and start there. Evernote is all about how you think. *Update as of Feb 2016 - I actually set up my notebooks vastly different than I did originally in this video. If you find yourself no longer using certain notebooks or notes, get rid of them. No use keeping digital clutter! Let your organization style evolve over time. Evernote have 4 different membership levels to choose from. The first is a basic plan and 100% free. You can upload up to 60MB per month with this option. The plus membership ($25 a year) allows 1GB a month. And lastly the premium version ($50 a year) allows unlimited uploads. There is a business option as well, which you can get more information on HERE. You can see Evernote's complete pricing information and features right HERE. Personally, I have the Premium version because I upload MASSIVE files to save, this is because I keep all my client information in Evernote. I think it is completely worth the price tag. The best way I can describe Evernote is a combination of OneNote, Dropbox, ShoeBoxed and a planner. Evernote makes every single process able to happen in one place. Their prices are fantastic and allow me to save money by working with clients, storing files and creating backups all in one place. Evernote also has a ton of Apps and tools to go along with the actual Evernote app. You can see all of their products on THIS page. Not only do they have tools for virtually everything, but you can seamlessly connect Evernote with other online tools through IFTTT (and if you don't have an account with them yet, YOU NEED ONE). Evernote can be accessed online and offline, from your computer, tablet, or phone. How you use Evernote is really up to you personal preference. Personally, I have blog post ideas, post backup, client data, worksheets, school notes, copies of my lease and other important documents and just about everything else you can think of in my notebooks. I use as few notebooks as I can and rely on tags to help me find what I need. Evernote isn't just for bloggers or business owners, it's also a digital place to store your ideas and goals. I have a personal journal I write in every morning. It's a great place for braindumps before bed or a place to store your new year resolutions. 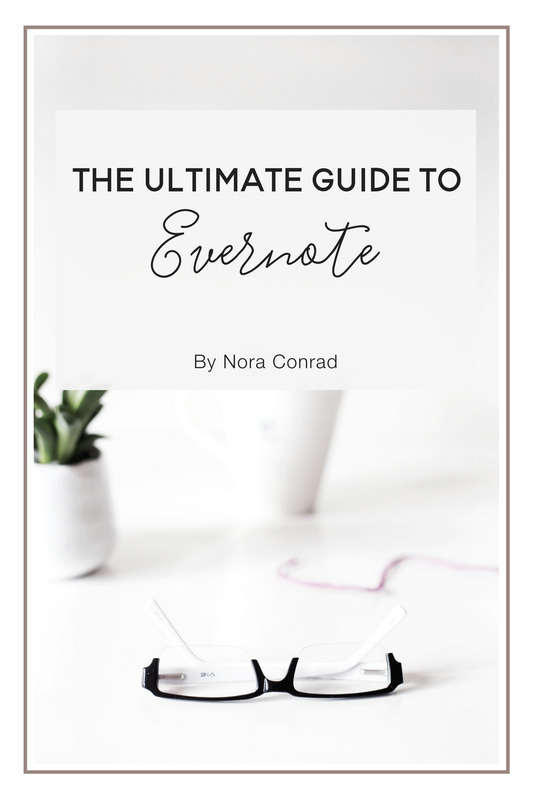 If you want to learn more about Evernote and using it both for business and personal notes, check out the free webinar recording I hosted with my friend Katie Price. We answered questions about the system and gave you a sneak peek of how we use Evernote in our personal life + businesses. Thank you to all the live attendees of our webinar! If you're catching the replay, our ecourses are no longer offered at the bundled discount, but you can still purchase them at the links below. Making Evernote work for you really depends on how much you use it. If you make the habit of using it every day, it'll become your most valuable tool. If you only use it to store things you'll never look at again, there's no point. Storing, saving and completing worksheets, workbooks, and downloadable goods. Yellowbook, I save any graphic designers, carpet cleaners, car repairs, virtual assistants and other service-based businesses in one notebook. How do you use Evernote in your life? Let me know in the comments below!